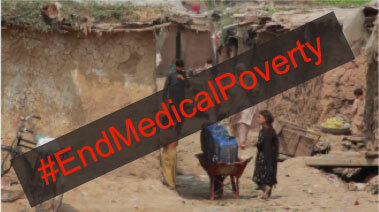 End medical poverty is Heartfile’s campaign to draw attention to the need for including UHC in the post 2015 framework. We draw on stories from Heartfile Health Financing in Pakistan to highlight the need for financial risk protection in health without which people are forced to forego healthcare, incur debt or catastrophic health expenditure in seeking healthcare. This is not a problem unique to Pakistan. More than 150 million people suffer healthcare-related financial catastrophe worldwide each year and 100 million are pushed into poverty. Protection against catastrophic health expenditures therefore needs to be part of the policy approach to UHC alongside promotion, prevention and access to basic services.